The LR14Bass is a double-tuned band-pass bass system, for both permanent and portable applications. Featuring double 12” long excursion woofers with Neodymium magnet structures, the LR14Bass delivers high quality, high output bass response from a very compact and weight efficient package. 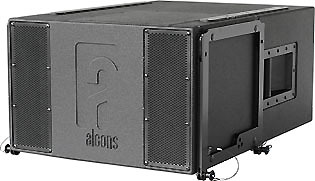 The special band-pass configuration offers LR14- matched bass response in full-space (flown) and increased efficiency in half-space (stacked) applications. The easy and accurate flying system, makes the system quick to set-up in combination with the LR14 line-array module.The SIS pre-wiring ensures complete cable/connector compensation between the LR14Bass and ALC. The LR14Bass is designed as high-efficient bass extension of the LR14, used in multiples depending on the array-length and low frequency requirements. The LR14B features an integrated top hat, enabling a stand-mounted “top/sub” combination together with 3 units LR14 on the BRK-3LR14 bracket (option). For full system performance, we recommend using the LR14Bass in combination with an ALC2 or ALC4 amplifier/controller. Driven by the ALC, the LR14Bass delivers maximum sound quality and output power with dedicated and inaudible (power and excursion!) protection (SDP circuit).